Handcrafted bags that blend function with fun. At Archimedes Wear we want to make life colorful. Each time we travel to Nepal, we work with local fair trade Co-Ops to design and create unique handbags, purses, and accessories for adults and kids. Shop online here, or visit us at one of our upcoming events. All of our bags from Nepal are handmade using fair trade practices. 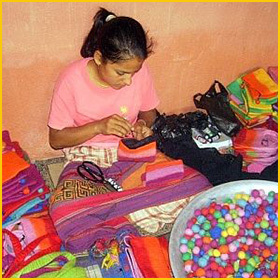 They help provide sustainable employment for groups of Nepalese workers, including various women’s Co-Ops. Because each item is individually crafted, it means no two items are ever the same. Click here for more info. Please view our events calendar to find out where our next booth will be. 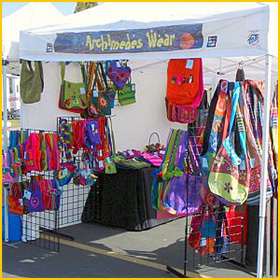 We do craft fairs, art and wine walks, and other events in many different locations in California and Nevada. As upcoming events are confirmed, we add all the details to our calendar, so please check back often. We hope to see you at one of our events soon! 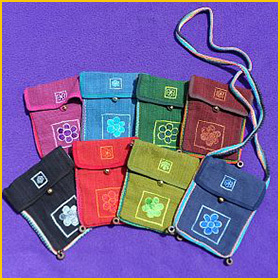 Archimedeswear is a locally owned business that sells colorful shoulder bags, felt purses, and other fair trade accessories from Nepal.